King Bhumibol Adulyadej celebrates his 60th anniversary on the throne in Thailand in the year 2006 by the Gregorian count and 2549 from the life of Buddha count. King Bhumibol is the longest reigning monarch in Thailand and in the world. The significance of the King's reign is probably little understood by people from other countries, but to the people of Thailand, however, this enduring monarch, who will be 79 years of age this December 5th, signifies something bordering on a heavenly occasion reserved for the gods. Buddhist and Brahma (Phram) ceremonies have been planned for a very long time, and living in Thailand, as I do, its hard not to see the devotion which Thai people give to their King. It is safe to say that King Bhumibol is the most revered monarch in the world. And as far as monarchies go in Southeast Asia the influence of preceeding dynasties of Kingship can be traced back to the Khmer Empire which ruled for over 1000 years at Angkor Wat in Cambodia and was finally sacked by Thai armies in 1431AD. The legends of the Khmer empire and their influence on Thai royalty is evident through the strong influence of Hinduism when conducting sacred ceremonies in Thailand. Brahmin priests were influencial in guiding the Thai monarchy to what it has become today unlike the monarchy in Cambodia which has little influence over the people. The monarchies of Laos and Burma (Mynamar) have been completely removed. At the grand palace in Bangkok there is a scale model of the Angkor Wat temple which is testimony to the reverence Thais have for their Khmer ancestor Kings. So today in the early 21st century the influence of Hinduism in Thailand with the accompanying offerings and prayers to Brahma is as important to Thais as Lord Buddha. In fact it is a Royal decree that both Buddha and Brahma have equal spiritual significance when it comes to making prayers and merit making. However, the Buddha is more widely recognized as the dominant spiritual teacher whereas Lord Brahma is looked upon as a god. 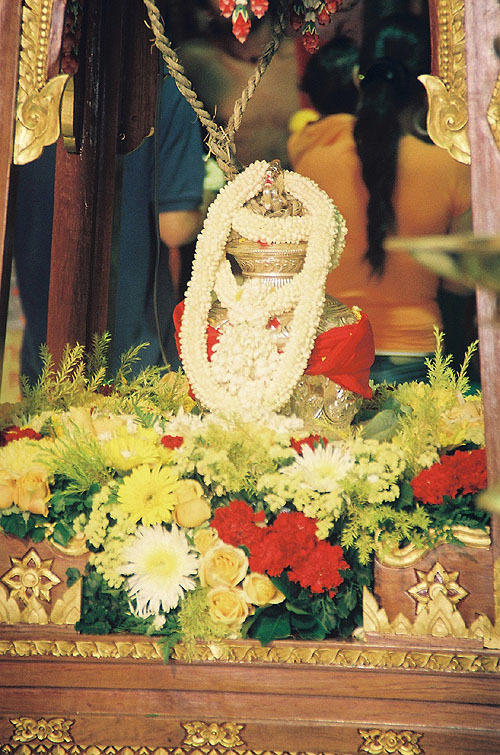 To demonstrate how important Brahma is to the Thai people was made starkly obvious when a deranged man destroyed the sacred Erawan shrine housing Lord Brahma in Bangkok. The emotional outpouring from the Thai nation was voiced in all the newspapers. The Erawan shrine is the most sacred shrine in Bangkok that harks back to Vedic times, and the Emerald Buddha in the grand place is the most sacred Buddhist shrine. Interestingly enough the emerald Buddha was taken from Laos. The Thai people take their devotion to heart and the destruction of the Erawan shrine brought a deep spiritual aspect of the Thai people to the surface. To recognize the royal occasion of the king's longevity as a monarch the president of the council overseeing the affairs of the Hindu temple at Wat Phra Si Maha Uma Devi (Wat Phra Si Maha Mariamman) on Silom Road in Bangkok decided to send a high Brahmin priest to India where water would be collected from the most sacred spots of India's five most sacred rivers and brought back to Bangkok. 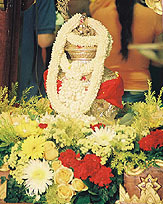 The Holy Water would then travel to three Hindu temples before finally being presented to the King on Coronation Day, May 5th, 2006. On April 30th the Holy Water was to be set in Wat Phra Si Maha Uma Devi. Having just returned from a pilgrimage to the Holy Land of Kuruksetra in Champassak Laos, the site of the 5th century Shiavite temple Vat Phu, I was well acquainted with the influence the Hindu gods had on the people. The Thai media on April 11th announced to the Thai public that the Holy Water for his Majesty the King would be brought from India as part of the King's 60th anniversary of his accession to the throne. The five rivers in India where the Holy Water was taken from was the Ganges, Yamuna, Saraswati, Saryu, and Komati rivers. It struck me that even after 2000 years the spiritual powers associated with India are playing a dominant role in what will be the worlds most sanctified ceremony on Coronation Day using Holy Water from India. Learning that this Holy Water for His Majesty would be housed at a Hindu temple in the heart of Bangkok prompted me to make a pilgrimage from Nakhon Sawan to pay my respects to the Holy Water. After experiencing Vat Phu and the sacred mountain of Lingaparvata in Laos, I realized it was more than curiosity that was drawing me to Bangkok. 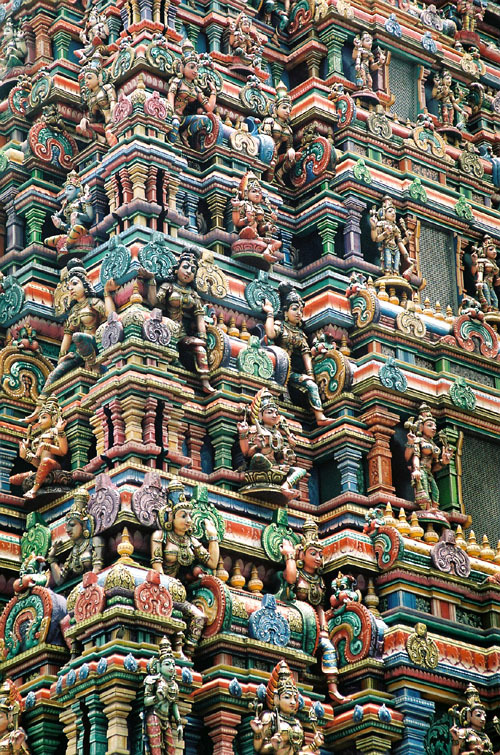 I could sense the spiritual devotion still strong in Southeast Asia coming from India. 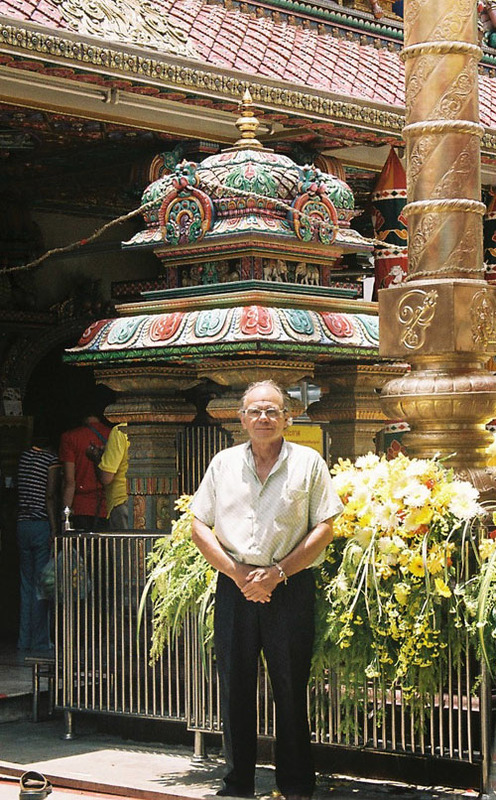 Where Vat Phu has a sacred spring constantly flowing into a catchment for pilgrims to drink and do personal ablutions, here in Bangkok was going to be water from the holy rivers of India. An opportunity to go see these five rivers in India may not be possible for me in this life time, but I knew I could travel to Bangkok, which I did, to wittness the Holy Water ceremonies surrounding the central shrine at Wat Phra Si Maha Uma Devi. Unlike pilgrims 2000 years ago who would walk hundreds of miles to dip in one of the holy rivers in India I found myself leaving at 6AM in the morning in a mini van that would take three hours from Nakhon Sawan to Bangkok. The only sense of an ancient pilgrimage I could feel was watching the sunrise spreading it's early morning orange glow over the rice paddys as the van made its way to Bangkok. This was an effort I knew I had to make to continue the thread of continuity from my emotional experiences I had with Shiva and Uma on the top of Lingaparvata in those windy early morning hours of February 10, 2006. Once in Bangkok I got on the Skytrain at Victory Monument station and headed directly to the Sala Daeng Skytrain staion on Silom Road. From Sala Daeng I took a bus directly to the Hindu temple. The bus stopped directly in front of the temple and as I walked off the bus carrying my tri-pod and camera bag I could see throngs of people passing through a gate with burning inscence and flowers everywhere. 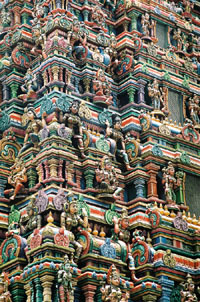 The sun was gleeming off the temple towers which were covered with hundreds of small Hindu gods all painted in bright rich colors. I immediately walked through the gate into the temple observing swarms of heavy set Indian men without tops exposing their dark moist skin laden with gold chains and amulets. The accents were distinctly Indian as they were all busily talking to countless numbers of people. I approached one of the Indian men and asked where the Holy Water from India was placed. In response I was asked what I was doing, and I said I was a writer and I wanter to learn more about the Holy Water. Immediately I was taken to a small room in the buildng next to the central shrine and introduced to Suraphong, the secretary of the temple council, and then to a Hindu priest who began telling me about Brahma, Shiva and Uma where upon I politely said I would like to write about the Holy Water. I was swiftly taken by another Hindu priest outside one of the gates, not the one I first entered, and asked to take pictures of the entrance. I was quickly and suddenly engulfed by the mood of the temple. It was vibrant with hundreds of people presenting large baskets of fruit and flowers to the gods. People were kneeling and praying everywhere I looked. It was almost impossible to set my tri-pod down because of so many people. I was told it was forbidden to take a picture inside the sacred temple where the Holy Water was placed. Then another Indian man came over and said they would make an exception. I think they were pleased someone was taking an interest. An Indian man followed me everywhere I went, watched every move I made to be sure I did not go into the inner most part of the shrine where the goddess Maha Uma Devi was enthroned. But just outside and directly in front of the inner most shrine there was placed a highly ornamented enclosure with a large golden urn set in the middle and drapped with golden colored flowers. Directly to the right of the urn was a portrait of His majesty the King enclosed in a golden frame. It all happened so quickly I didn't have time to think about anything except where I could place my tri-pod. I found myself in the center of a sacred Hindu temple with dozens of people praying and dozens more presenting gifts. The Indian man was watching me and I was standing there trying to look very serious as I looked for the best place to take pictures. People paid no attention to me. I was just an obstacle that they had to walk around. But as I became more engulfed with the moment I found a place to take my pictures. I tried to focus through the smoke from the inscence, the glare from all the lights and the people walking in front of the camera. The lighting was of a deep gold radient hue with many dark shadows and brightly colored flowers. I shot picture after picture, some with a flash and some without, trying as many settings as possible to capture at least one good representation of the mood inside the temple. Then I was drawn into my camera as I wanted to capture the moment worrying if any image would come out with the right lighting effect. Would this holy event I was allowed to photograph slip right past me rather than being able to capture any images and all I would have would be memories? 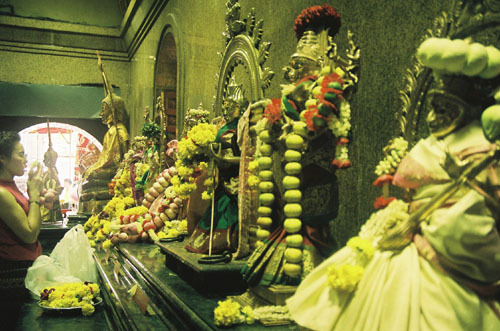 It's a rare moment in time and space to be caught up so completely in a sacred Hindu ceremony. My thoughts went back to the ancient temple at Vat Phu which today has aged and all the stones have eroded and broken and the colors are gone. But here in this temple I found myself admidst golden colors and pungent inscence which were so intense you could not help feel being apart of some distinctly different world full of devotion and prayer. And then the object of my focus stood out like some setting sun as the golden urn sitting in the center commanded a presence that radiated out into the whole central shrine. Here was the Holy Water from India that was going to travel around Bangkok with visits to temples with Vishnu and Brahma and fimally to the King. What source of devotion caused all this to take place? How could I possibly understand how through thousands of years the same rivers that had been visited by millions of prilgrims in India were here now receiving the same veneration and adulation. This was the spiritual force that was infused in the royal line of Kings and all I could do was stand there hoping to just capture the moment with my camera. It reminded me of the the geni in the bottle. Inside this urn was Holy Water so sanctified that only the King could receive it. All I could do was stare in wonder knowing that here in this temple Maha Uma Devi was giving her blessings to the sacred rivers from her home far away in India. Its very difficult to put into words the mood that was perpertrated in this shrine other than it was a devote and pious setting where the deepest out pourings of visible prayer could be seen every where. India was alive and vibrant and was still nourishing the deeper needs of people even as the traffic of the 21st century urban cityscape was just outside the temple walls rather than the elephants. Nothing had changed, the gods were still here. Then no sooner had I entered I left the central shrine and walked outside and was asked by the Indian man who was watching me all the time as I was taking photographs if I would like to have some Indian food as their guest. I accepted as it was prepared by two other Indian men by placing the food on open banana leaves which is Indian custom. I was in India for a short time. 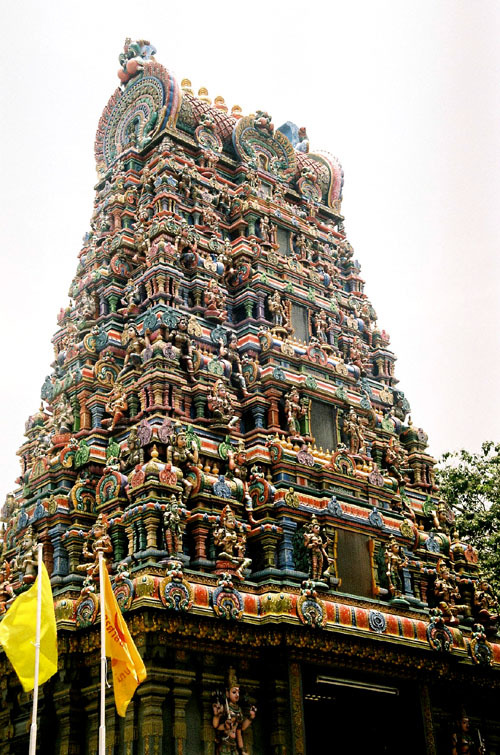 I went outside to the main road and stood back and realized that inside the temple was an ancient spiritual force that could not in any way be explained other than it was there. 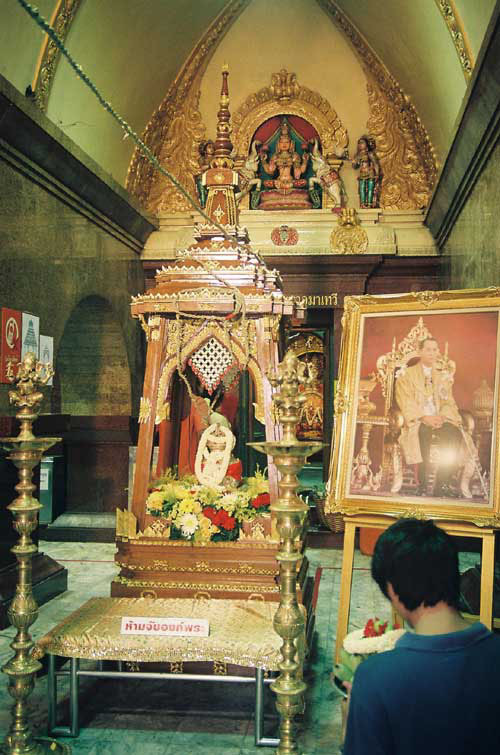 People were there, deities were there, and what was predominantly there in front of the Maha Uma Devi deity was a portrait of King Bhumibol next to a golden urn filled with Holy Water from five sacred rivers in India. I had completed my pilgrimage. I saw how in the 21st century a monarchy is in full devotion to the sacred gods of India and the land from which they come from. This was a part of Thailand that would only be seen once in a life time. It was a small insight into the royal power which guides the people of Thailand much like it must of been for the people of the Holy Land of Kuruksetra in Laos or the ancient city of Angkor Wat, Ayuthhaya or Sukhothai. 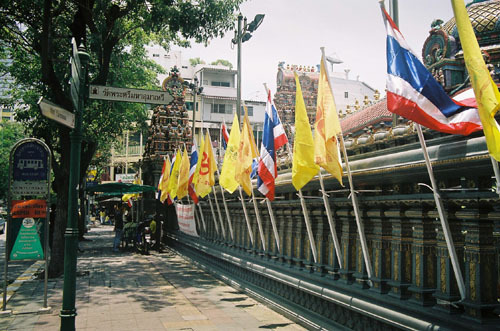 The royal dynasties were still functioning if only you took the time to walk into the temple on that April 30th day on Silom Road and saw the Indian priests escorting people around the Holy Water and in front of their gods to pay their respects. On May 5th, Coronation Day in Thailand, the Holy Water will be presented to the King. I will be able to feel the spiritual significance of this gift to the king having been allowed inside the temple to see the golden urn next to the kings portrait. Going on a pilgrimage to Wat Phra Si Maha Uma Devi made the Coronation Day for me more relevant in relation to the long historical lineage of kings and gods that goes back in time when the gods were able to travel freely between earth and heaven. Among all the urban distractions present I was still able to briefly set foot in a temple and experience something ancient that was still being honored today. Truly this was a pilgrimage that bridged the past with the present.